El Encanto Inn is a gracious, Hacienda stle hotel,located in the heart of San Jose del Cabo. Beautiful hacienda style architecture, lush tropical grounds with the smell of jasmine,the splash of a fountain and soft latin music, relax and soothe your body and mind. The Hotel consists of TWO buildings, the POOLSIDE and the GARDEN side, are across the street from each other. Standard rooms and Grand Suites are located on the GARDEN side. Poolside suites and the 2 bedroom poolside suite are located on the poolside. The POOLSIDE section contains a relaxing private pool and lounge area for all our guests to enjoy. For our guests convenience 'Mi Ensalada' open for lunch and breakfast from 8AM to 4PM. for breakfast they serve the best 'Chiaguiles' in town and are known for there organic salads and portebello mushroom burgers for lunch. 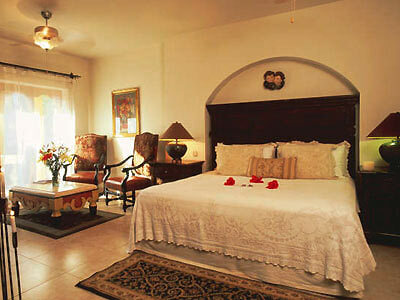 Come stay with us and experience the warmth and comfort of old Mexico.